They are becoming a bit retro now. Typically grey/yellow, occasionally grey/blue and on rare occasions available in the red, purple and yellow "De Stijl" colours you see above on the right. They are not as sophisticated as later models, but they are built like a tank and last for years. These were -- and still are -- so popular, we still sell reconditioned ones despite the oldest ones being almost eighteen years old! You can get a reconditioned one here: Reconditioned Dyson DC01 and you can get parts from us here: DC01 Spare Parts. You can get a reconditioned one here: Reconditioned Dyson DC01 and you can get parts from us here: DC01 Spare Parts. I thought I'd update this after four years. We no longer routinely sell reconditioned DC01 machines. But if you really, really, really want one, we might be able to get you one if you >>contact us<<. Or sometimes, the good people, collectors and enthusiasts on the forum here have nice ones to sell if you make a fresh topic and ask for one. The reason for the topic update after four years was because of this topic and our recent update to the room title to include the lesser known DA 001 Dyson. 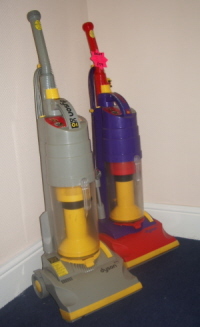 The first vacuum cleaner sold under the Dyson name was the DA001, launched in 1993. It was a domestic upright model that used the patented "Dual Cyclone" technology and was made in Chippenham, England. After a short period, it was renamed the DC01 and production later moved to Malmesbury, at the company's new factory/research centre. The DA001/DC01 had a single motor which provided the suction and also drove the brushroll directly via a single rubber toothless belt with no form of "brush control" (where the user can turn off the brushroll for use on hard floors), so was mainly designed to use on carpeted floors. It stored its hose on the back of the housing as part of the handle wand, and removing the handle wand enabled this stretch hose to be used. This was the only Dyson upright not to use washable pre-motor filters; these had to be purchased and replaced every 3 months. It also had a choice of post motor filtration – standard or HEPA (High Efficiency Particle Arrest) according to the model purchased. For ease of parts identification, we have a sticky topic on the subject of fixed and swivelling soleplates: Dyson DC01 Variants: Fixed and Swivelling Sole Plates -- The Differences. And is not generally available new any more. Used ones are equally scarce in good order. There are other slight differences between standard DC01's and the early DA 001 machines (and I am working from memory here so someone correct me if I am inaccurate or make additions as necessary). The DA001 and DC01 are essentially the same machine, the DC01 is basically a facelift of the DA 001. Most parts are interchangeable, most new after-market parts fit both variants (but after-market bumpers do not fot DA 001's), but if sourcing original used soleplates, cleaner heads, bottom motor housings, hoses or a wand, better to ask the question here to see if what you intend to buy will fit, or take pot luck. Because chances are the seller (unless a Dyson guru like some folk here) won't have a clue and you will be left wondering why the £5 used hose from eBay wont fit your DC01/DA001. I believe the very early models were assembled in South Wales, before Dyson took assembly in-house at Chippenham? So would the switch from DA001 to DC01 coincide with that move? I've never come across a DA001, how long were they in production? Glad to see an update to this topic! Especially now DC01s are shifting into collectors territory rather than daily vacuum! Help yourself to as many pics as you need, I'll put more up when I get it refurbished! Shame! I've never really given them much though before, but I suppose they are quite rare now. I know of a few in the hands of other collectors though, so some are saved! I saw a job lot of DC01s earlier with a DA001 in there, can't find it now! We have a few of those. We'll match or beat anyone on eBay for anything we have. I'd say you guys are probably the best place for DA001 stuff now. Most other dyson recyclers probably don't know the difference, and put it with all the other dc01 stuff. I posted it on Dysons wall, and was asked to email the ratings plate over and they would try and date it. Long shot, as I've tried this before with Dyson and got nowhere, but you never know!